Finished Size: 1.75" x 4.75" | 1/8" Thick with Stock Message Engraved on Key tag. 1/8" Thick - Wording is Engraved on the FRONT (can be engraved on back for additional Charge. Our Engraved Key Tags are made in the USA of indestructible 1/8” thick ABS plastic with a durable Acrylic Cap (top color). 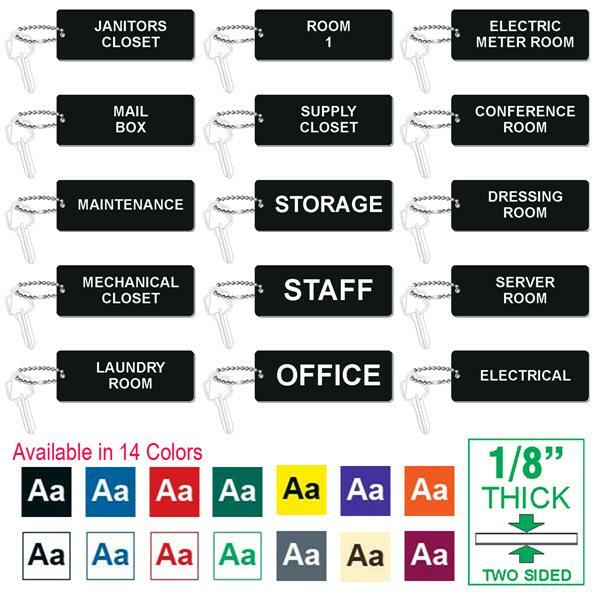 Perfect size, sturdy plastic key tag for your key organization needs. Engraved on ONE SIDE. Same Color on both sides. Finished Size 1 3/4" Wide x 4 3/4" Length. Price includes your text or wording on ONE side, up to 7 lines.